Beth started doing band-type things in grad school, fronted Clear Blue Betty from 2000–2007, then starting in 2009, became a solo artist, co-founding Madison’s Girl’s Rock camp and letting music consume all of her professional activities. 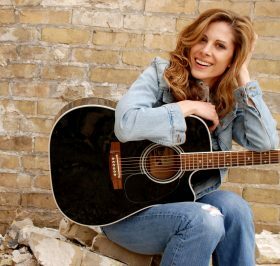 She’s a classic singer-songwriter of the write-chords-and-good-lyrics-on-acoustic variety, and her mission is to help others (ladies of all ages especially) unlock their creative rockery. We talk about “Wrong Side of Gone” from the Beth Kille Band’s 2015 EP Stark Raving Songbird , “Dead Man in a Dream” from her solo record Dust (2012), and “Through the Walls” from the Through the Walls EP by Clear Blue Betty (2007). We also listen to “Little Bit Drunk” from Beth Kille’s Ready (2010). The intro/outro music is “Go Back” from Clear Blue Betty’s Never Been a Rebel (2004). Learn more about Beth and hear more music at bethkille.com. Here’s a recent interview with her covering Girls Rock Camp and her collaborative Gin, Chocolate & Bottle Rockets project. Here’s that Liz Petty album she sang all the songs on. This is Jake Johnson’s studio where both Beth and I have recorded. Hear more conversation with Beth and more songs by signing up for a recurring donation, then clicking here.